In December 25.398 people bought a Fiat Group new car. That number is down 20.25% compared to one year ago. It’s certainly a horrible result that a registrations of a big car maker decrease that much in one of its key markets. However, as it happened in the last months, Fiat managed to increased its market share thanks to specific models that allowed the group to have a reduction on sales lower than total market’s. Once again Italian car market is down above 20%, to 22.51%, which could be considered the worst among big car markets in the world. Italians refuse to buy new cars as government policies look for charging with more taxes those having one, and economic situation does not seem to get better. 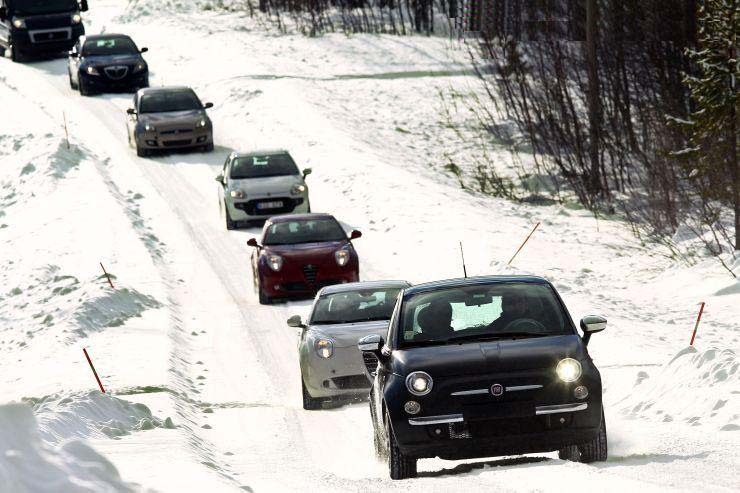 It results in a difficult situation for Italy and Fiat as the crisis seem not to hit rock bottom, so in the new year car sales should continue to fall. 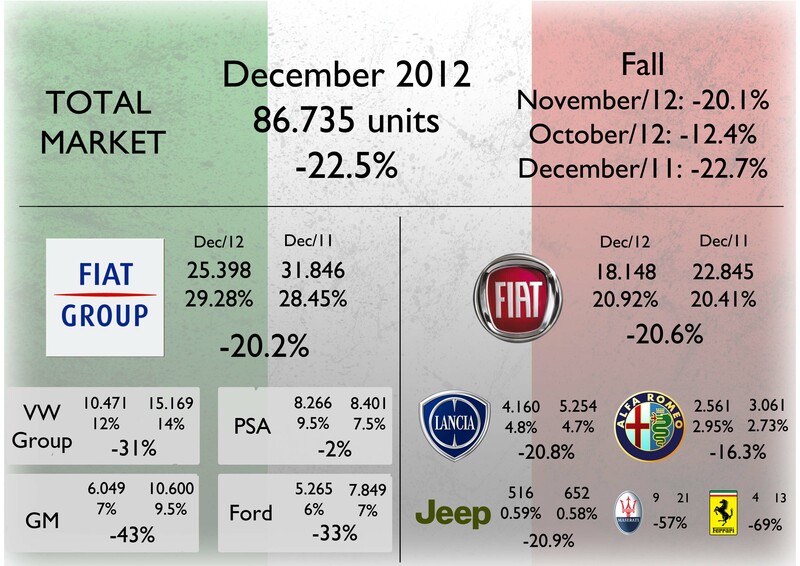 However it is expected Italian car sales fall to slow down as the comparison base for 2013 will be 2012, a terrible year. Such scenario is where Fiat must do its job: to keep its market share with few new products. And it is doing it thanks to the Panda and the latest 500L. Alfa Romeo was the best performer among all the brands of the group. Its registrations fell only 16% and only Ferrari and Maserati dropped much more than total market. Fiat brand, Lancia and Jeep fell just a bit less than 21%. Alfa’s ‘good’ results allowed this brand to increase its share among the brands of the group from 9.6% in December 2011 to 10.1% last month. However the brand composition is pretty much the same and the group is strongly dependant on one brand (Fiat) and two models (the Panda and Punto). However Fiat Punto’s drop in sales has decreased that dependence and by the end of 2012 the whole group depends on more models. 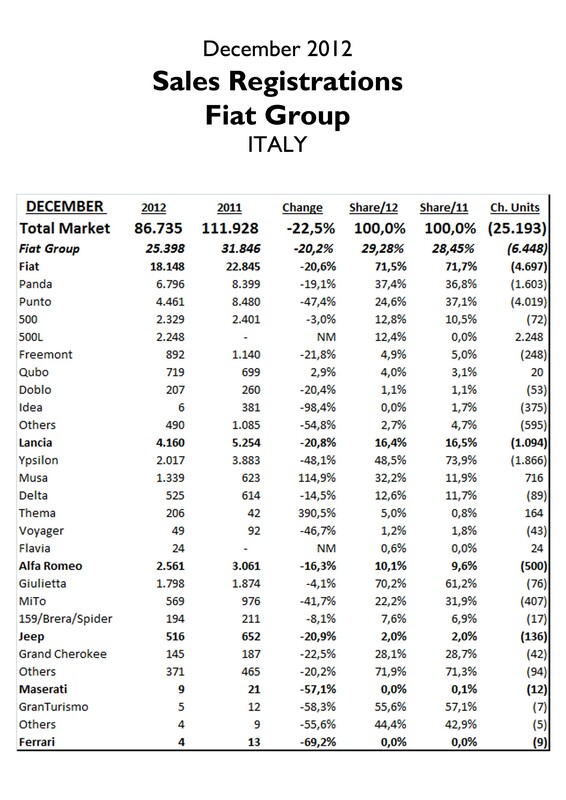 In December 2011 the Panda and Punto together counted for 53% of Fiat Group’s sales in Italy. One year later the mix counts for 44% with higher share for the small 500, Giulietta and the new 500L, which counted for 8.9% of the group’s sales. In the other side there is the Lancia Ypsilon which continues to fall in the ranking and came from being 12.2% of the group’s sales in December 2011 to an alarming 7.9%. In terms of change, all Fiat models fall except for the Qubo. The 500 fell only 3%, which is not bad at all. The new 500L helped Fiat to offset the fall of the Punto but unlike last month, total sales registrations for the Panda, Punto and 500L together were lower than Fiat Panda and Punto sales figures in December 2011. 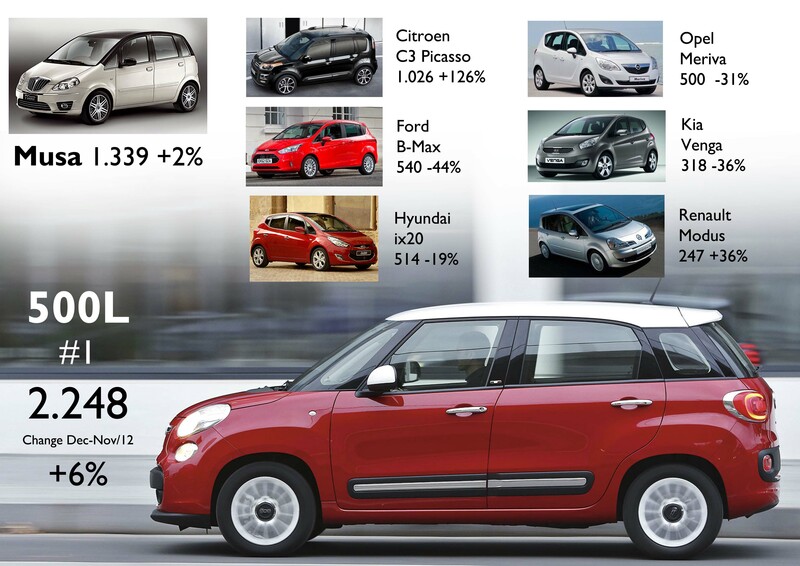 Even if the 500L had a wonderful month and was Italy’s 6th best-selling car, its numbers are not big enough to offset the extreme fall of the Punto. But Punto’s fall is not as worrying as Lancia Ypislon’s. 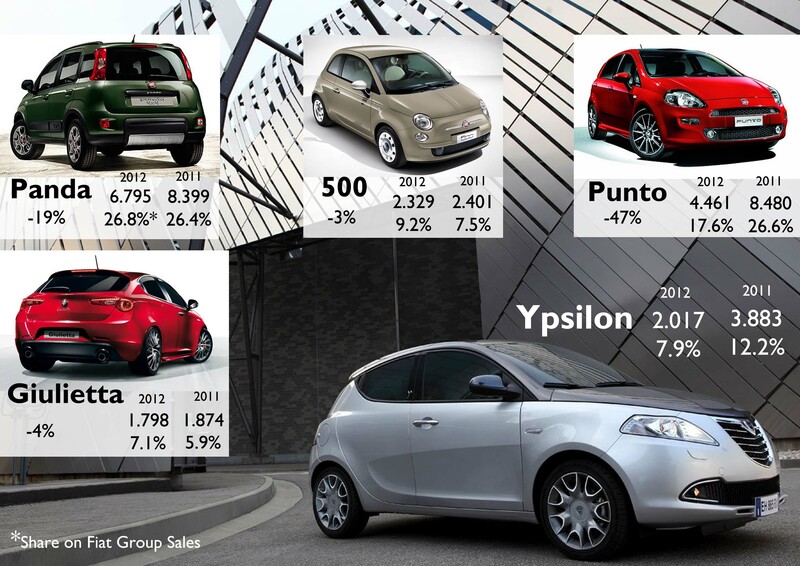 The Punto is a 7-year-old model but the Ypsilon was introduced 18 months ago and its performance in terms of sales is pretty similar to the Fiat. Its sales figures were down 48.1% against 47.4% of the Punto. It is bad for the whole group that a car that has been always one of its best-sellers is now falling dramatically 18 months after its introduction. But is even worse for Lancia brand as the Ypsilon usually counts for more than 2/3 of its sales and was because of it that the brand is still alive nowadays. 2012 Full Year Analysis coming soon. I’m very sorry for the Ypsilon because I really like the new one. It deserved, in my opinion, much more success..
Is the 500L already on sale in the whole europe? However, I’m quite surprised for its sales in italy. I thought it wouldn’t have sold much for its price.. Yes, the Ypsilon deserves a better place in the ranking but at the end Lancia will have the same result it had with the second generation: a popular car only in Italy. I think the 500L is available everywhere in Europe except for the UK. For 14.500 euro is not expensive at all. I read it starts at 15.500 euros on fiat website, but, with a couple of optionals, is very easy to spend more then 20.000..
which is quite a lot for many people. Yes, with optional the price can be around 20.000. 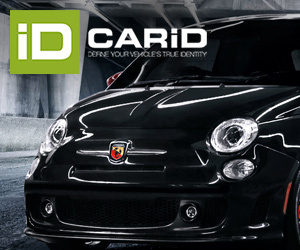 I don’t think they will do the Abarth version as the 500L is a family car. Maybe for America they could develop a sporty version but I would disagree if it is named Abarth, as I think only sporty cars should use that name. Well actually an Abarth version is not necessary for a Mini MPV. However we know that the US version will get a 165bhp 1.4Turbo engine as read elsewhere. This should give very good performance I believe. I agree. The Crossover version is more suitable for a sporty version. Nice to see the sales of the Lancia Thema and Flavia. What are the YTD sales of them? ?